The 5-out motion offense is a fantastic primary offense for basketball teams at any level, but especially youth basketball teams. It’s a positionless offense that relies on spacing the floor and a set of rules that assists players to determine their movements and actions. Due to players making decisions and reading the play of their teammates and defenders, the 5-out motion offense is great for teaching players how to play basketball. Who Should Run the 5-Out Motion Offense? As a positionless offense, I highly recommend the 5-out motion offense for all youth basketball teams since it allows all players on the team to develop into well-rounded basketball players. This is important because it’s impossible to know which players will grow in height and which players won’t. Countless times I’ve seen players who have matured and grown early in life get assigned to the post position only to have their teammates who developed at a later time quickly catch up to them. When this happens the player who developed early has had barely any practice at dribbling, shooting from the outside, etc. So it’s imperative that all youth coaches use a positionless offense like the 5-out motion offense. But with that said (sorry for the rant), it’s especially a great offense for teams that lack height and want to run a fast offense with a lot of movement. • Creates positionless players – All 5 players on the court are required to pass, cut, dribble, shoot, screen, etc. This is imperative for a great youth basketball offense. • Can be used as a delay offense – If your league doesn’t have a shot clock and you want to hold up the basketball, the 5-out motion offense will provide movement and keep the defense honest while not looking at scoring options. • Players learn how to play basketball – Don’t overlook this benefit. Players learn to read their teammates and defenders and make decisions accordingly. This is an important process that players won’t learn from running set plays all game. • Every player contributes – When running this offense, one or two players can’t dominate the basketball. All players will be involved and must contribute to the team’s offense. • Requires great spacing – If players are all in the correct positions, your team will always have great spacing at all times. This opens up driving lanes and makes it difficult for defenders to help each other. • Difficult for opposition teams to scout – Since there are no ‘set’ passes or actions, teams won’t be able to work out a specific action they can stop to disrupt the offense. • The opposition can’t crowd the key area – All defenders on the opposition team will be required to guard all areas of the floor. This prevents them from keeping their biggest players on the inside. • Easy to teach due to progressions – One of the best things about the 5 out motion offense is that it can be taught in progressions. Players aren’t forced to learn the complete offense all at once which will overwhelm them. • Not great for teams with one dominant player – If you have one or two dominant players that contribute the bulk of your team’s scoring, this might not be the offense for you if you want your team to continue to play that way. All players must contribute in the 5 out offense. Even the weaker players. • Players can get stuck in the motions of the offense – When you first implement this offense with your team, you’ll find that they’re so focused on running the offense properly, that they forget to look for scoring opportunities. • Sometimes difficult with a shot clock – Similarly to the above point, if your players aren’t constantly searching for scoring opportunities, the shot clock can play a factor and force your team to rush a shot with a few seconds left. • Can take some time for players to master – While your players can quickly pick up the actions and movements of the 5 out, it does take time for players to learn how to quickly read the game and make smart decisions on the court. The 5 out motion offense is governed by 5 rules that players must follow at all times for the offense to run smoothly. 1. If your being denied and the player with the ball looks at you, back cut immediately – Never hesitate. This assumes you’re only being denied one pass away from the basketball. 2. If you believe you can attack the basket and score on your defender, do it – Players must understand their own abilities and the abilities of their defender. If a player thinks they can attack, they should do it immediately on the catch. 3. Players must square up to the rim when they have the basketball – A player can’t telegraph what they’re going to do by facing a certain direction. By squaring up, players can shoot, pass, or dribble. 4. Every action must be performed with purpose – If you cut, cut hard. If you’re screening, focus on setting a great screen. Never pass and stand still. 5. Spacing is always on the NBA three-point line – The NBA three-point line is about 2 feet behind the normal three-point line. ‘5 out’ simply means that all offensive players on the floor are starting outside the three-point line. There are 5 spots that must always be filled unless players are performing an action like screening or cutting. These spots should be on the NBA three-point line which is about 2 feet behind the regular three-point line used by all other levels. When teaching the 5-out motion offense to your team for the first time, I highly recommend you use cones to mark these 5 spots on the floor to allow players to get used to where each position is. There are 4 progressions that you gradually introduce one by one into the continuity of your 5-out motion offense. All coaches must make sure they start with progression one and move up without skipping steps. This allows the players to gradually learn the concepts of the 5-out motion offense without being overwhelmed with the entire offense all at once. The easiest way to begin teaching your team the 5-out offense is to start with the basic movements of passing and cutting in a 5-0 situation. 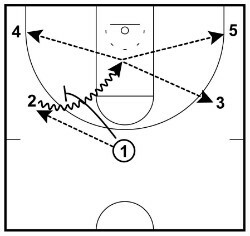 Start by setting out 5 cones at the 5 fill spots on the court. Let your team know that when they’re not cutting, they must be in one of these 5 positions. There are 4 passes and cuts that can be made during progression 1. On a top to wing pass, the passer basket cuts all the way through the key and fills the opposite corner. Once 1 has cut, 3 and 5 must fill up the positions closer to the basketball. On a wing to corner pass, the passer also basket cuts all the way through the key and fills the opposite corner. 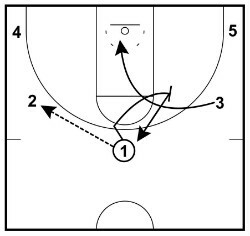 Once 2 has cut through, 3, 5, and 1 must all fill up the positions closer to the basketball. 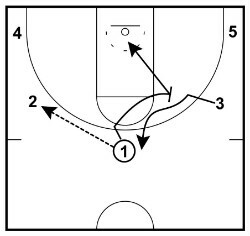 On a corner to wing pass, the passer basket cuts and replaces themselves. The other 4 players wait in the same spot for the next action. On a wing to top pass, the passer basket cuts and then fills the corner of the same side they cut from. 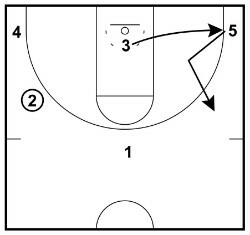 On 3’s cut, 4 fills up closer to the basketball and then 3 replaces them in the corner. The other 3 players wait for the next action. Have your players practice this progression until they’re comfortable with the passes and cuts. This simple progression can be a great offense for a youth basketball team by itself. It will provide great spacing and get your players reading the play and making decisions. • Remind your players that if they’re being overplayed, they must back cut immediately when the player with the basketball is looking at them. • To set up the defender and get open on a front cut, after passing the player should take one step away from the ball and then explode to the ball-side of their defender on the cut to the rim looking for the basketball. • If the defender ‘jumps to the basketball’ taking away the front cut, the passer should back cut and try to step in front of their defender to open up the passing angle. • Always watch the basketball on cuts. If a shot is put up, they need to know immediately to establish rebounding position. • Cut hard on all cuts to the rim. Doing so will make the cutter a threat to score which will force weak side defense to help. Once your team is comfortable with the cutting phase (making the correct cut 80% – 90% of the time), it’s time to introduce the action of screening away after a pass instead of cutting. This action can be performed on any top to wing, wing to corner, or wing to top pass. The only pass it can’t be performed on is the corner to wing pass. Before implementing this action, you must decide whether you want the player being screened to always curl, or whether you’ll give them the option of cutting to the top or curling. I recommend all youth basketball teams (below high school) get this player to curl off the screen every time so that there’s no confusion. For high school teams and higher, you can allow them to read the defense and perform the most appropriate option. 1. 1 makes the pass to 2 on the wing. Instead of cutting, 1 decides to set an away screen. Note – It’s important that 2 waits while this screen is being set so that the curling option is not missed due to passing to 4 too quickly. 2. 1 screens for 3 making sure that they set the screen at an angle that allows the 3 to cut to the rim. 3. 3 can either front cut or back cut towards the rim depending on how quickly the defense reacts to the screen. But they must cut to the rim since they were screened. 4. After 3 has used the screen, 1 pops back out to the same spot that they set a screen from. If 1’s defender attempts to help on the cut from 3, you’ll find that 1 will often get an open shot from the top of the key. 5. 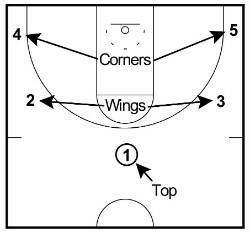 After the cut, 3 fills the weakside corner position since 5 has filled 3’s previous position on the wing. Then all players are back in position for the next action to be made. If you’re coaching an experienced basketball team, you can give the player being screened the option to curl or to pop out to the perimeter and receive the pass. The difference when using this option is that the screener must go the opposite direction to the cutter. If the cutter decides to pop out to the perimeter, the screener will cut to the rim and then fill the corner. If the cutter decides to curl, the screener will pop out to their original position. 3. 3’s defender cheats and goes under the screen so 3 pops out to the top perimeter position to catch and look for the open shot. 4. Reading this, 1 cuts to the rim because they must go the opposite direction of the cutter. 5. 1 then fills the corner position as 5 has filled 3’s previous spot on the wing. I’ve found that inexperienced teams can struggle with option 2 so I recommend starting with option 1 and then progressing to option 2 if you think your players are capable. • Players must be setting screens on the correct angle. This means the screener’s bum should be facing somewhere between the player with the basketball or the basket. Too often youth players will set screens too high that allow the defender to quickly slip under it. • The player setting the screen must make the player being screened aware with a verbal cue and a visual sign. I recommend you teach the screener to hold their arm up in a fist and call out the player’s name before setting the screen. Once your players are comfortable with cutting and screening away, next up is the action of setting on-ball screens. This action of the pick and roll is often very effective because the offensive players are spaced out well. The on-ball screen can be used after any pass in the offense. 1. 1 passes from the top to 2 on the wing and then sets an on-ball screen on their defender. 2. 2 uses the on-ball screen and drives hard to the rim surveying the options that are presented. 3. Depending on how the defense reacts, 2 can pass to any of the perimeter players or make the shot in the key. 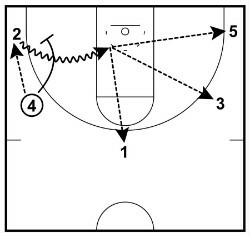 If the basketball is kicked out and the shot isn’t immediately taken, all players must find one of the 5 fill spots and the 5-out motion offense starts again. 1. 4 passes to 2 in the corner and then sets an on-ball screen on their defender. A lot of coaches who run the 5-out motion offense make it a rule that on each pass to the corner the passer sets an on-ball screen. So if it works for you, consider incorporating it as a rule into your offense! • As with the previous progression, it’s super important that players are setting the on-ball screen at the correct angle that allows the player with the basketball to attack the rim. • The three players not involved in the pick and roll should do their best to move into open positions where they can catch and shoot or catch and drive. • Start to introduce to the players that they must take into account each player’s skill set before making an action. For example. Your team should not set an on-ball screen for player that can’t dribble the basketball well. • Just like in the screening away progression, players must be giving a visual and verbal cue to the player they’re about to set an on-ball screen for by saying their name and holding up a fist. Another action to add to this continuity offense is the ‘dribble at’ action. This can be used when a player with the basketball is being heavily pressured and the only options to pass are being denied well by the off-ball defenders. In this scenario, the player with the basketball may decide to dribble towards another player at a different spot. When this happens, the two offensive players involved (the dribbler and the player they’re dribbling towards) have two options. If the player without the basketball is being denied, they can make a hard back cut looking to receive the basketball for a layup. If they don’t receive the pass, they fill the weakside corner, the other players rotate towards the basketball, and the next action begins. The other option is to perform a hand-off between the two players. This is similar to the pick and roll where the other 3 players on the court should hold their positions and wait. The player that receives the hand-off should attack the rim and kick out to shooters if the defense slides over to help. • When performing hand-offs, the player with the basketball should rotate their hands so that they’re on the top and bottom of the basketball. This allows the player receiving the hand-off to grab the basketball on the sides. • In my opinion, I don’t like hand-offs for youth basketball. For my youth teams, I have them automatically back cut on a dribble at. Once your players have learned the basic 4 progressions of 5-out motion offense, you’ve established a fantastic primary offense that will teach them how to read and play the game of basketball. Now that they can confidently perform all the actions, the next important step is for players to work out what actions work the best for them and their teammates. • Players will work out that the best players to set on-ball screens for are the quick guards who make great decisions. • The best players to away screen for are those that cut hard to the rim and can finish the layup or close shot. • The bet shooters on the team should primarily set away screens so that they’re cutting back out to the basketball for the open shot. While a lot of this knowledge will develop with experience, I believe it’s important for the coach to talk to the team and each player individually about what they’re good at and what they need to improve on. Doing so will help their decisions when running the 5-out motion offense during the game. Once your team has mastered the basic progressions of the 5-out motion offense, you can choose to add a more advanced flex cut progression. This is best used on a pass from the wing to the top of the key and can potentially give you an open layup off the flex cut or an open jump shot off a down screen. 1. 2 makes the pass to 1 at the top of the key. 2. After making the pass, 2 will basket cut as usual. But instead of filling to the same side, 2 sets a flex screen for 5. 3. 5 uses the flex screen and cuts through looking to receive the pass for the layup. If 5 isn’t open, they simply cut all the way through to the corner as 4 has moved up the wing to replace 2’s spot. 4. 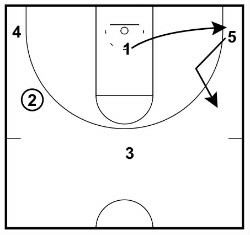 3 then sets a down screen for 2. 5. 2 uses the down screen and pops out to the perimeter looking to receive the basketball for the jump shot. 6. 3 can reverse pivot and seal 2’s defender if they have a mismatch inside. If not, 3 fills the closest corner. Even if the offense doesn’t get a great look from the flex option, you will notice now that all five spots are now filled and the team can move on to the next action of the offense. Another variation of this offense I wanted to share with you is the option to ‘cut through the nail’ every time a player cuts to the top of the key. This is most commonly seen in Bob Huggins’ Open Post Motion offense. Instead of filling to the top spot just like any of the other 4 spots, players are required to L-cut through the nail. 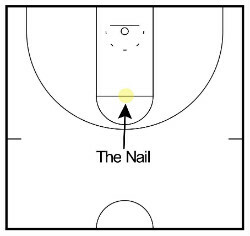 Note – The ‘nail’ is the spot at the very middle of the free-throw line. When players cut through the nail, they’re required to decided whether to back cut or to pop out to the top spot depending on how their defender is playing them. If the defender is denying them from receiving the basketball, the player must immediately back cut and then fill the weak side corner. If the defender is playing off them, the player cuts out to the top spot to receive the pass. 1. It will take away the defenders ability to get a deflection which leads to the opponent’s fast break. 2. It can lead to some easy scores off the back cuts. The best way to get the basketball inside to players who have a mismatch is to allow those players to establish quick post up position after every through the key. The player posting up is only allowed to hold this position for 1 – 2 seconds before clearing out if they don’t receive the pass. This ensures that the 5-out motion offense continues to run smoothly. To take advantage of this mismatch, it’s important that players with the basketball are looking at cutters to take advantage of the 1 – 2 seconds that they secure inside position. Posting up isn’t restricted to your biggest players. Any match up on the floor with an advantage in the post can use this technique. One thing a lot of coaches will find confusing is that since all our players are standing outside the three-point line, who’s going to rebound!? The answer to this question will depend more on the personnel on your team and how aggressive you want to be rebounding the basketball. I’ll give you three options. Pick the one you like the most depending on your coaching style and players on your team. 1. The point guard always plays safety. The other four players crash the boards. 2. The point guard and shooting guard always play safety. The other three players crash the boards. 3. Everyone below the free throw line rebounds. Everyone above the free throw line plays safety. What you’ll quickly realize is that the 5-out motion offense can lead to a lot of offensive rebounds as long as your designated players are willing to work hard for them. By starting on the perimeter when a shot is put up, it’s incredibly difficult for the defense to box out an offensive player with a running start. If you have any tough and athletic players on your team, expect them to grab a lot of offensive rebounds! 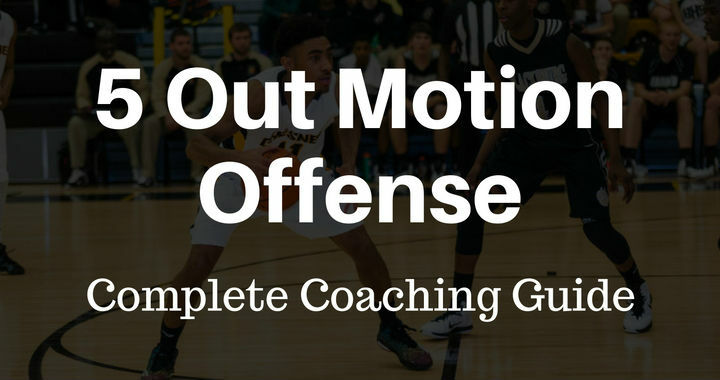 The 5-out motion offense is a great offense for any basketball coach to learn and implement with their team. Being a very common offense, even if you don’t use it with your own team, it’s important for all coaches to learn about so that they know how to defend when playing against it. It allows players to practice all skills, gets the whole team involved, and can be easy to teach as long as you’re using the right progressions and not trying to implement the whole offense at once. Any basketball coach who uses this offense will know they’re improving their players!